Please join us at next Meany PTSA General Meeting on Thursday, March 21st from 7:00-8:30 pm in the Meany Library. Help set our goals and priorities for the remainder of this school year and for next year, including ideas for how PTSA fundraising can best support our school. Everyone is welcome! We are excited to announce that our new Assistant Principal, Mr. Foyston, will be at the meeting to introduce himself and share some school updates. And, Mr. Finney will give a progress report on Meany's spring musical, The Lion King. Also, planning is underway for the Meany Arts Festival, which will be held at the school this year. Come to learn how you can get involved! GOOD NEWS! Your generous contributions to the Meany PTSA Annual Fund — from this school year and from last school year — are now eligible for matching funds. Many employers will match their employees’ donations to non-profit organizations. We have received the required documentation from the IRS, which means that you can reach out to your employers for matching funds for your donations, and for your volunteer hours in some cases. This is an easy way to multiply the impact of your philanthropic giving, and we hope you will take this additional step to help the Meany PTSA. Questions? Please contact meany.annual.fund@gmail.com. THANK YOU! Join the PTSA board as a Co-Treasurer to help manage funds, by depositing donations in the PTSA bank account and writing out checks for PTSA bills and teacher reimbursements. You'll be shown how to keep track of financial transactions. Once a year, you'll work with the board to develop the budget and oversee a CPA to file taxes. Please contact Karen Axtell, Meany PTSA Co-Treasurer, to learn more. Meany is excited to participate in our second year of the Global Reading Challenge. To become experts in preparation for the challenge, the teams will read 10 books. We are forming teams now and our goal is to take 1 to 2 teams for each grade level to the competition on April 4th at Denny Middle School in West Seattle. Sign-up forms/permission slips are available in the Main Office. Please contact Meany's Librarian, Mrs. Mary Vester, for more information or if you have any questions. mhvester@seattleschools.org or 206-413-2153. "Lion King rocks! Every rehearsal, we come together, tired from the school day. After a couple of hours of singing and dancing, the ensemble leaves with a buzz of positive energy, smiles on our faces. It is a blessing to work on this show with our students and adult production team. The snow took away three rehearsals, and we’re struggling to catch up. We still hope to stage 6 productions over two weekends, but stay tuned. We’ll decide before Spring Break if that’s feasible. Stop in at rehearsal some Tuesday or Thursday, and join in the fun." Registration packets are available in the main office for Co-ed Track & Field. Completed packets must be returned to the office by Wednesday, March 20th. Note: Physical Examination forms are required for all athletes in order to participate. Please contact Meany Athletic Director, Gus Montgomery, with any questions. All grade levels and skills are encouraged. Practices will be on Mondays & Thursdays after school from 4:30 - 5:30 pm at Meany Middle School/Miller Field. Track meets will be on Saturdays at Chief Sealth or Nathan Hale High School. The first practice will be on Monday, March 25th. The first track meet will be on Saturday, March 31st. Please join us on Wednesday, March 27th at 7:00pm in the Meany Gym for a fabulous evening of musical entertainment featuring all of Meany’s band ensembles (Cadet Band, Senior Band, and Jazz Band) as well as Meany’s BWB Drumline! You need not have a student in one of the band ensembles in order to attend. Everyone is invited! Information was sent home with students about what time to report to school and other details. We need a few volunteers to assist that evening — supervising students, running the video camera, and collecting donations at the door. Please contact Mr. Mosgrave if you can help or if you have any questions. There will be a separate performance featuring Meany's orchestra ensembles the following week on Tuesday, April 2nd at 7:00pm, also in the Gym. We have one exciting detail to share....Mr. Mosgrave has been coordinating with the music teachers at Meany's feeder elementary schools and there will be students from some of those schools who will join us in performing at this concert. It should be a lot of fun! The Yearbook Club is working hard to put together this year’s Meany Middle School yearbook, but we need more photos. If you have taken any pictures of all-school events, sports, concerts, etc., PLEASE upload them ASAP. You can upload your photos here or by using the hjeshare app on your phone. Use school code 7181 for Meany. 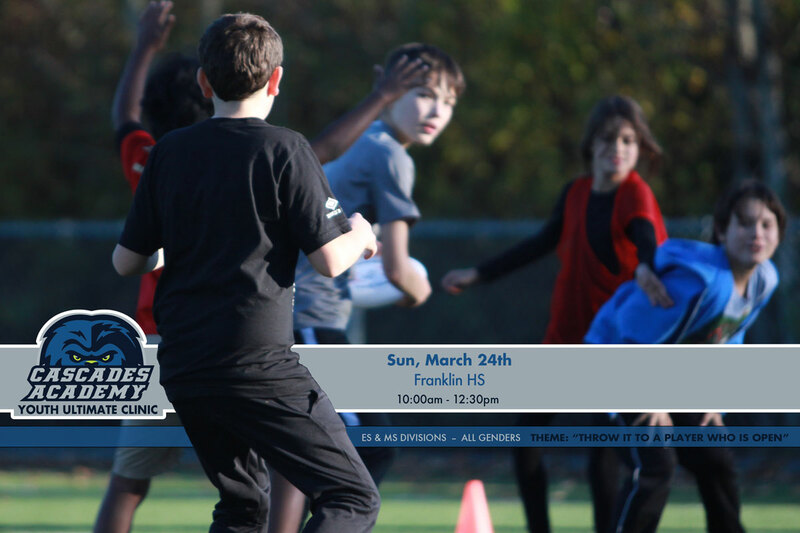 Seattle Cascades, Seattle's pro ultimate team, is hosting a youth clinic on Sunday, March 24th from 10:00 am to 12:30 pm at Franklin High School. All abilities are welcome - beginner to advanced - and all genders. Cost is $35 for the clinic, or $50 includes a disc, shorts, or shirt (one item). Scholarship is given to all who need it. No questions asked. Please contact Monica Johnson with any questions. The ARC of King County and Parent to Parent are hosting a 5-part series of training workshops to become an IEP Parent Partner Volunteer. The trainings will be geared towards African American families of children (K-12) with intellectual and developmental disabilities. The series will focus on the following: Understanding the IEP, Building your IEP Team, Understanding Special Ed Culture, Building your Behavior Support Team, and Common Challenges families face within the Special Ed System. Here is the flyer for the event. This program prepares parents to support other parents navigating the special education system. IEP Parent Partners are volunteers who will be connected to 1 to 2 families in need and provide support such as attending IEP meetings during a one year period. All participants will receive a certificate of completion at the end of the program. ATTENDANCE AT ALL 5 SESSIONS REQUIRED. The training series will be held on Tuesdays from 4:00 - 7:00 pm at Rainier Avenue Church in the Rainier Valley community, beginning on April 2nd. Dinner and Refreshments will be provided at each training. See the program details here. Please contact Richard Mullen at RMullen@arcofkingcounty.org or 206.829.7036 or Adanna Abakporo at AAbakporo@arcofkingcounty.org for questions or to RSVP.